Recently, we were lucky enough to be gifted some really fun things to do with the kids. Canal Toys sent us some of their new So Bomb DIY kits. 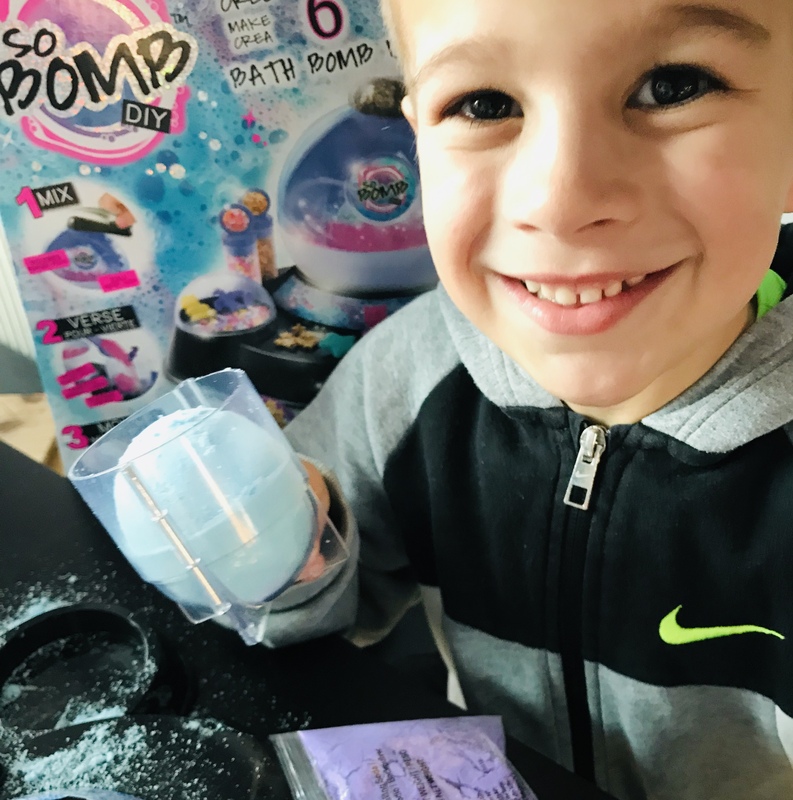 The one you can see us enjoying in the pictures is the So Bomb DIY Bath Bomb Factory, which retails around £19.99, and can be purchased in any of the usual retailers we all know and love. You can make 6 bath bombs with this particular pack, and it also includes some little surprises to put into the middle of the bath bombs, and some sprinkles to decorate. Most coincidently, and not long ago, Fin and I had been watching some kids TV, and we saw these bath bomb sets on an advert. He was very excited when he saw them, so I knew I should say yes to this particular chance to review the products. Especially as Christmas was only a month ago, my purse is on lockdown, it’s especially not opening for toys just yet! We cleared a space, and got all the bits out (pictured below), and read the instructions. It seemed very easy to create a bath bomb, so we chose our colours and got going. Fin started to make a turquoise bath bomb, and he chose a matching cloud secret surprise to place in the middle. Although the age recommendation for this kit is 3yrs+, Indi enjoyed mixing the powders, and found all the bright colours exciting. Once you’ve mixed your two powders together with a surprisingly small amount of water, you mould it into the ball shape. You then leave 30 minutes or so to dry. That’s the hard bit; to endure 30 minutes of constant questions. 30 minutes finally passed, plus a few more to make sure. We tapped the bath bomb out of its mould, et voila! It worked! We had ourselves a beautiful, blue bath bomb, complete with hundred and thousands encased into the top, and a secret surprise for Indi to find in the bath later. Shortly after, we made a lovely pink and green bath bomb. Fin decided to use all the remaining sprinkles and stars on. We also got a bit bold, and decided to leave it less time. Not advised 😉 It crumbled before we could get it to the bath. So, Fin decided to experiment with it and add some water. It fizzed up lots and lots, all over the table, and he found this very amusing of course. Upon throwing the lovely blue bath bomb into the bath, it fizzed up lots. It turned the water a lovely aqua blue, much to Indi’s delight. The bath bomb fizzed for around 30 seconds or so, and the kids enjoyed trying to find the little blue cloud Fin had hidden in the core. The scent was nice and mellow, not overpowering, and there was no staining of the bath afterwards. The whole process of making the bath bomb, to soaking in it, was great for the kids. They spent a long time splashing about in the blue water. We’re looking forward to making the remaining 4 bath bombs in the pack. Fin is excited to experiment with making patterns with the other coloured powders. Thank you, Canal Toys, we had great fun. We’re forever grateful for the products we had the privilege to try out. Here’s the So Bomb DIY range again to check out.